1. Preheat the oven to 220°C, gas mark 7. Trim and scrub the beetroot (approx 600g) and cut into thin wedges. Place the wedges in a roasting tin, drizzle with the olive oil and roast for 35-40 minutes or until tender. 2. Rinse 200g of the lentils, crumble the vegetable stock cube and put in a saucepan with the mixed herbs and cover with water. Bring to the boil and cook until tender, about 20 minutes. 3. Roughly chop the goats cheese and ½ bunch of salad onions. Blend in a food processor or blender with the yogurt and plenty of black pepper. 4. 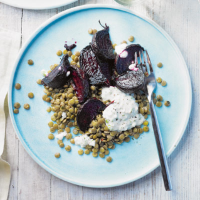 Drain the lentils, pile onto serving plates and serve topped with the beetroot and raita.